Zevenbergen is a small city located in the Dutch province of Noord-Brabant, northwest of the large provincial city of Breda. 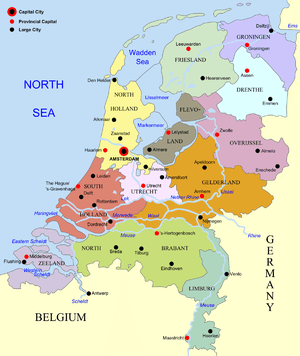 It is located approximately 30 miles south of Rotterdam, near the waterway, Hollandsch Diep (an estuary of the Rhine and Maas or Meuse Rivers), which separates the provinces of Noord-Brabant and Zuid-Holland. Today its population is approximately 15,000, which is about 3 times the size of Zeeland, Michigan. One can traverse to Rotterdam today via the modern highway A-16 or by rail to Dordrecht, located just southeast of Rotterdam. Zevenbergen has one of the oldest railroad stations still operable in the Netherlands today. So it is likely that my great-grandparents, Johannes and Helena Reyst, traveled this same railway line to get to Rotterdam in 1890. Zevenbergen was famous for its sugar production from the mid-nineteenth century until the end of the twentieth century. The railway and the harbour on the Hollandsch Diep were a direct result of the need to transport the sugar. The city is also noted for its very famous, but brief resident – Vincent van Gogh, the impressionist painter. In 1864, van Gogh was sent to the elementary boarding school of Jan Provily located in Zevenbergen to study. Today Zevenbergen is part of the larger municipality of Moerdijk, which consists of several smaller towns that where merged in 1998. An aerial satellite view of Zevenbergen shows that much of the town appears to have been developed after World War II; not sure if this was a result of bombings during the war or population growth after the war. Housing consists mostly of neat but modest row houses, instead of free-standing dwellings. There are 3 larger hotels that accommodate most visitors to the area.